Married Name Her married name was Jaquish. Hannah Worden married David Henry Jaquish. Name Variation Mary Alice Moore was also known as Alice. Name Variation Mary Alice Moore was also known as M. Alice. 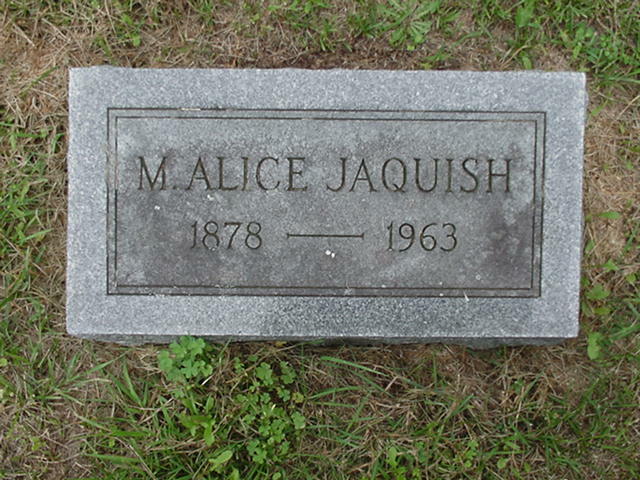 Married Name 31 December 1900 As of 31 December 1900,her married name was Jaquish. Mary Alice Moore was born on 19 November 1878. She was the daughter of James Nelson Moore and Laura A. Rhodes. Mary Alice Moore married Orrin Wesley Jaquish, son of Orlando R. Jaquish and Lucy S. Cass, on 31 December 1900. Mary Alice Moore died on 22 October 1963 at age 84. 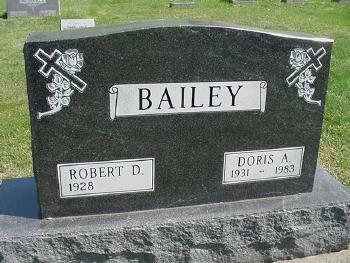 She was buried after 22 October 1963 at Button Cemetery, Buena Vista, Richland, Wisconsin. James Nelson Moore married Laura A. Rhodes. Married Name Her married name was Moore. Laura A. Rhodes married James Nelson Moore. Married Name 26 June 1950 As of 26 June 1950,her married name was Bailey. Doris Adelia Graves was born in 1931. She married Robert Downing Bailey Jr., son of Robert Downing Bailey and Kathryn W. Greenheck, on 26 June 1950. Doris Adelia Graves was buried in 1983 at Saint Mary's Catholic Cemetery, Richland Center, Richland, Wisconsin. Married Name Her married name was Rosenberg. Lori A. Bowell was born on 30 July 1966. She was the daughter of Robert E. Bowell and Dorothy P. Johnson. Lori A. Bowell died on 2 February 2006 at age 39. 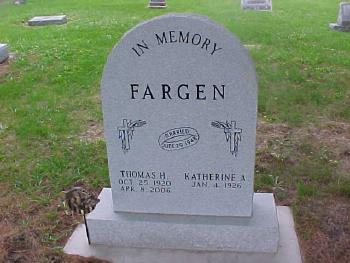 She was buried after 2 February 2006 at Big Hollow Lutheran Cemetery, Bear Creek, Sauk, Wisconsin. 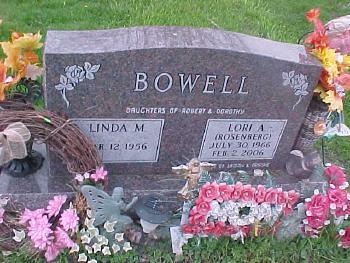 Linda M. Bowell was buried at Big Hollow Lutheran Cemetery, Bear Creek, Sauk, Wisconsin. She was born on 12 March 1956. Married Name 1939 As of 1939,her married name was Wagner. Married Name 10 February 1980 As of 10 February 1980,her married name was Fargen. Janet B. Werner was born on 17 September 1916. She was the daughter of Emil Werner and Mildred King. 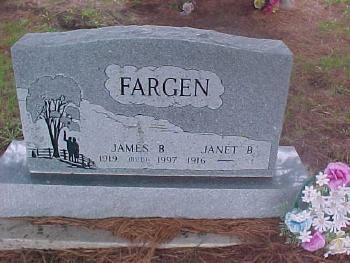 Janet B. Werner married James B. Fargen, son of James Michael Fargen and Nellie E. Dorgan, on 10 February 1980. Janet B. Werner died on 22 August 2014 at age 97 Janet B. Fargen, age 97, of Reedsburg, died on Friday, August 22, 2014 at the Reedsburg Area Senior Life Center. She was born on September 17, 1916 in Pittsville, the daughter of Emil and Mildred (King) Werner. Jan moved to Milwaukee in 1930. She then worked as a dental assistant. She was married to Walter W. Wagner in 1939. Jan also worked as a nurse's assistant at the Milwaukee County Hospital for many years. On February 10, 1980, she was married to James "Bud" Fargen. They moved to Reedsburg in 1981 where they operated Fargen's Pub for many years. Jan enjoyed being a photo artist in her spare time. Survivors include her three children: Lynn (Frank) Berkes, of Durham, NC, Dawn (Tony) Adams, of Cedarburg and Charles Wagner, of Milwaukee; her grandchildren and great-grandchildren; other relatives and friends. She was preceded in death by her husband, Bud, on July 9, 1997; her son: Roger Wagner; one sister: Ruth Eichfeld; and two brothers: Roger and Gene Werner. A Mass of Christian Burial will be conducted at 11:00 A.M. on Wednesday, August 27, 2014 at St. Patrick's Catholic Church at Loreto with Father Lorin Bowens officiating. Interment will be in Our Lady of the Fields Cemetery. The family will receive friends from 4:00 P.M. to 7:00 P.M. on Tuesday at the Hoof Funeral Home in Reedsburg. The Hoof Funeral Home is serving the family. She was buried after 22 August 2014 at St Patricks Cemetery (old), Bear Creek, Sauk, Wisconsin. 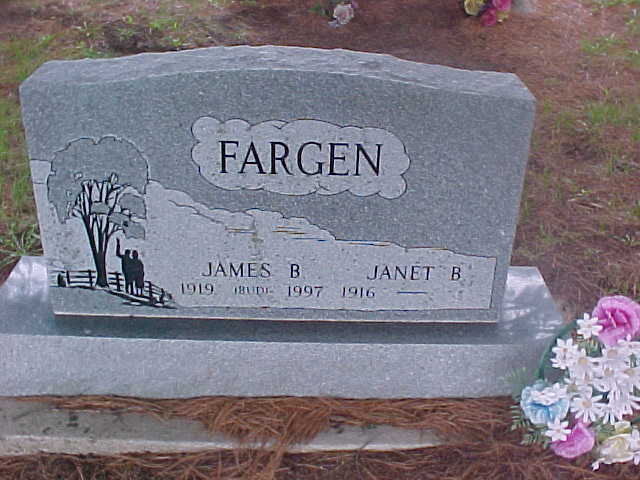 Married Name 29 June 1948 As of 29 June 1948,her married name was Fargen. Katherine Ann Faber was born on 4 January 1926. She was the daughter of Gerald S. Faber and Bertilla Schmitz. Katherine Ann Faber married Thomas Henry Fargen, son of Thomas Edward Fargen and Helen Byrne, on 29 June 1948 at Bear Valley, Sauk, Wisconsin. Katherine Ann Faber died on 29 March 2012 at age 86 Katherine A. Fargen, age 86, of Plain passed away on Thursday, March 29, 2012, at her residence following an extended illness. She was born on Jan. 4, 1926, in Bear Creek Township the daughter of Gerald and Bertilla (Schmitz) Faber. Kathryn was married on June 29, 1948, to Thomas H. Fargen. She was a member of St. Patrick’s Catholic Church Loreto Ridge and the Plain American Legion Auxiliary. Survivors include, four children, Thomas G. (Jeanne) Fargen of Plain, Edward Fargen of Plain, Joanne (Ronald) Ripley of Loganville and Dennis Fargen of Eugene, Ore; five grandchildren, Chris Ripley, Erin, Thomas W., Ellen and Katie Fargen; four siblings, Larry (Rosemary) Faber of Decorah, Iowa, Pauline Dobson of Reedsburg, Joey (Paul) Schilling of Watertown and Edith Fargen of Readstown, nieces, nephews, other relatives and friends. She was preceded in death by her parents, Gerald and Bertilla Faber; her husband, Thomas H. Fargen; and three siblings, Marjorie Parkhurst, Jane Schwartz and Philip “Top” Faber. A Mass of Christian Burial will be held on Monday, April 2, 2012, at 11 a.m. at ST. PATRICK’S CATHOLIC CHURCH in Loreto Ridge. Father Loren B owens will officiate with burial in the Our Lady of the Fields Cemetery. Visitation will be held on Sunday, April 1, 2012, at the church from 2 p.m. to 4 p.m. and again on Monday at church from 10 a.m. until the time of Mass. She was buried after 29 March 2012 at St Patricks Cemetery (old), Bear Creek, Sauk, Wisconsin. Name Variation Agnes V. Hess was also known as Agness. 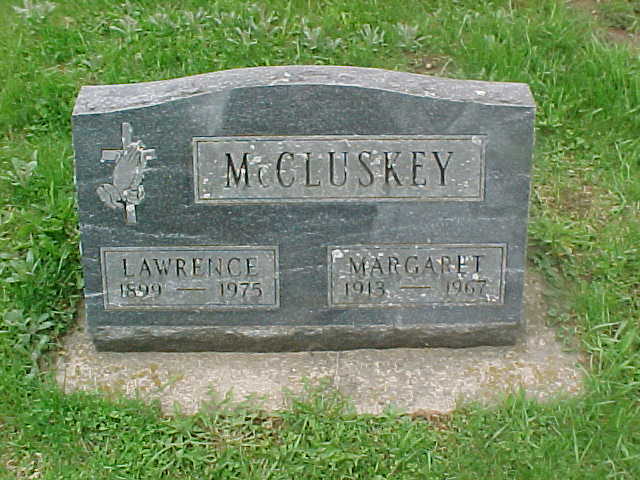 Married Name 28 November 1953 As of 28 November 1953,her married name was McCluskey. Agnes V. Hess was buried at St Patricks Cemetery (old), Bear Creek, Sauk, Wisconsin. She was born on 27 August 1929 at Sauk, Wisconsin. She was the daughter of William Hess and Lorraine Clark. Agnes V. Hess married Clarence P. McCluskey, son of Peter F. McCluskey and Anna V. Byrne, on 28 November 1953. Agnes V. Hess died on 10 June 2014 at age 84 Agnes V. McCluskey age 84 of Plain passed away at her residence on Tuesday, June 10, 2014 following an extended illness. She was born on August 27, 1929 in Windfield Township, Sauk County the daughter of William and Lorraine (Clark) Hess. 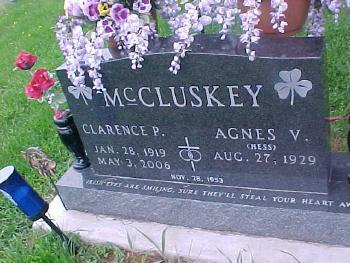 She was married on November 28, 1953 to Clarence P. McCluskey. Agnes attended the Richland County Normal School and taught in 1 room schools at Grove School and Hickory Grove School. She was a member of St. Patrick’s Catholic Church, the Plain American Legion Auxiliary Post #398, Sauk Deanery and the St. Rose Altar Society. Agnes was the Loreto Ridge news columnist for over 40 years, parish coordinator for St. Patrick’s, 4-H leader for the Loreto Livewires, active with the ARC and was in charge of the Sunshine Club. Survivors include, 8 children, Marty (Patsy) of Hillpoint, Sheila (Pat) Drea of Plain, Kevin of Hillpoint, Shane (Maggie) of Lime Ridge, Kathy (Steve) Olson of Middleton, Patrick (Mary Ellen) of Hillpoint, Brian of Hillpoint and Rory (Rowena) of Hillpoint, 12 grandchildren, Stacy McCluskey, Brady McCluskey, Cody (Amanda) McCluskey, Jim Drea and fiancée Stephanie, Sean (Katie) Drea, Jessie Drea, Peter McCluskey, Jenny McCluskey and fiancé Ryan, Micki and David Olson, Joshua and Jacob McCluskey, a great granddaughter, Sophia McCluskey, a special family, Tim and Chris Drea and their children, Benjamin, Keagan and Shannon, 4 brothers, Arthur Hess, Allen “Jack” (Mary) Hess, Andrew “Pete” (Sharon) Hess, Arland “Buzz” (Mary) Hess, a sister, Anna Marie “Susie” Hess Anderson, a sister-in-law, Janice Hess, a brother-in-law, Tom Roessler, a uncle, Dave Clark, a aunt, Gladys Bruss, 2 special nieces and caregivers, Debbie (Roessler) Labansky, Rosie Bodendein, a special son-in-law and caregiver, Pat Drea, many other nieces, nephews, relatives and friends. She was preceded in death by her parents, William and Lorraine Hess, her husband, Clarence McCluskey, 2 brothers, Adam and Albert Hess and a sister, Alva Roessler. A Mass of Christian Burial will be held on Monday, June 16, 2014 at St. Patrick’s Catholic Church Loreto Ridge at 11:00 A.M. Fr. Larry Bowens will officiate with burial in the Our Lady of the Fields Cemetery. Visitation will be held on Sunday, June 15, 2014 at St. Patrick’s Catholic Church Loreto Ridge from 3:00 P.M.-7:00 P.M. and again on Monday at the church from 10:00 A.M. until the time of Mass. In lieu of flowers memorials may be made to a charity of choice or an act of kindness in Agnes’s memory. The Richardson-Stafford Funeral Home in Spring Green is assisting the family with the arrangements. [S250] U.S. Federal Census 1930 U.S. Federal Census, by Ancestry.com, Year: 1930; Census Place: Winfield, Sauk, Wisconsin; Roll: 2609; Page: 3B; Enumeration District: 40; Image: 540.0. Married Name Her married name was McCluskey. Margaret (?) married Lawrence McCluskey, son of Arthur McCluskey and Bridget O'Malley. Margaret (?) was born in 1913. 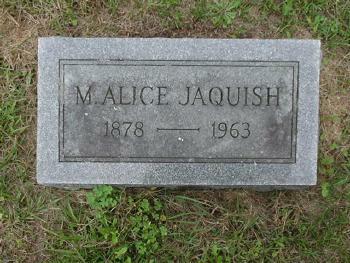 She was buried in 1967 at St Patricks Cemetery (old), Bear Creek, Sauk, Wisconsin. Name Variation Esther M. Ruhland was also known as Ester. Married Name 20 November 1924 As of 20 November 1924,her married name was Haas. Esther M. Ruhland was born on 8 July 1907 at Wisconsin. She was the daughter of Joseph Michael Ruhland and Margaret Kraemer. Esther M. Ruhland married Ludwig L. Haas, son of John Baptist Haas and Kunigunda Brendel, on 20 November 1924. Esther M. Ruhland died on 17 March 1967 at Prairie du Sac, Sauk, Wisconsin, at age 59. She was buried after 17 March 1967 at St Luke Catholic Cemetery, Franklin, Sauk, Wisconsin. [S373] U.S. Federal Census 1940 U.S. Federal Census, by Ancestry.com, Year: 1940; Census Place: Bear Creek, Sauk, Wisconsin; Roll: T627_4523; Page: 5A; Enumeration District: 56-9. Lucille D. Haas was born in 1928 at Wisconsin. She was the daughter of Ludwig L. Haas and Esther M. Ruhland. 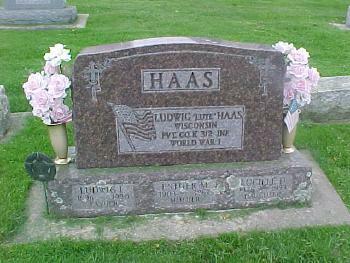 Lucille D. Haas was buried in 1997 at St Luke Catholic Cemetery, Franklin, Sauk, Wisconsin. 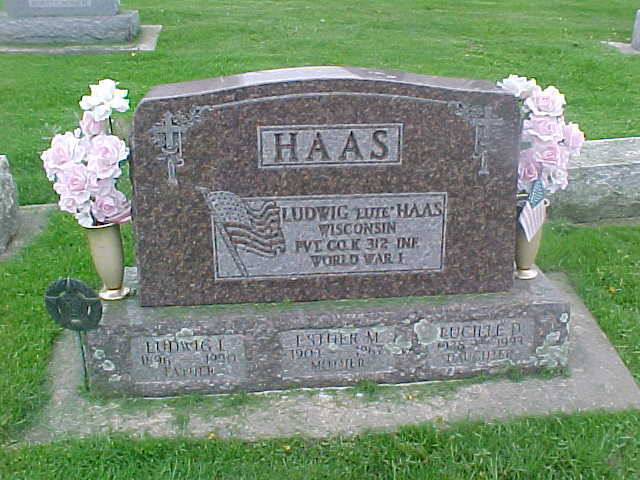 As of 1997, Lucille D. Haas was never married. Married Name Her married name was Burmeister. Lorraine Haas married Emie Burmeister. Lorraine Haas was born circa 1925 at Wisconsin. Lorraine Haas died before 2017. Rita M. Haas married Francis A. Ruhland, son of Simon J. Ruhland and Christina Schwartz. Rita M. Haas was born on 29 March 1930 at Wisconsin. Rita M. Haas died on 1 July 2017 at age 87 Rita M. Ruhland, age 87 of Plain, passed away peacefully on Saturday, July 1, 2017, with family at her side at the Greenway Manor Nursing Home, the place she called home because of the excellent care and attention she received while there. She was born March 29, 1930 at the farm in Loretta Ridge, the daughter of Lute and Esther (Ruhland) Haas. She was married to Francis A. Ruhland on April 30, 1952 and he preceded her in death on April 8, 2002. Rita was an active member of St. Luke’s Catholic Church, the National Council of Catholic Women, the Plain American Legion Auxiliary where she was a past president and lifetime member. Rita loved playing cards, bowling, cooking, garage sales, travelling and camping in Briggsville. 7 grandchildren: Jennifer & Christina Severson, Richard and Hunter Pulvermacher, Michael Ruhland, Oscar Valdez, and Peyton Ruhland. Nieces, nephews, other relatives, friends and her extended family at Greenway Manor. She was preceded in death by her parents Lute and Esther Haas, Sisters Loraine Burmeister , Lucille Haas and infant sister Margaret, brothers Cletus Haas, Butch Haas, Louis Haas, brothers-in-law Sylvester Ruhland, LaVerne Ruhland, Harold Ruhland, and sisters-in-law Bernice Tollefson, Lucille Reiner, Carolyn Reiner. A mass of Christian Burial will be held on Friday, July 7, 2017 at 11:00 A.M. at St. Luke’s Catholic Church in Plain. Fr. John Silva will officiate with burial in the church cemetery. The rosary will be recited at 4:45 P.M. on Thursday, July 6, 2017 with a visitation immediately following from 5:00 P.M. – 8:00 P.M. at St. Luke’s Catholic Church in Plain and at 10:00 A.M. until the time of service on Friday. The Richardson-Stafford Funeral Home is assisting the family with the arrangements. Married Name circa 1881 As of circa 1881,her married name was Klinkner. Anna Tomas was born at Wisconsin. She married Mathias H. Klinkner, son of Frederick William Klinkner Sr. and Katherine Lehnhoff, circa 1881. Fredrick W. Klinkner was born in November 1882 at South Dakota. He was the son of Mathias H. Klinkner and Anna Tomas. Fredrick W. Klinkner married Theresia (?) circa 1905. [S245] U.S. Federal Census 1900 U.S. Federal Census, by Ancestry.com, Year: 1900; Census Place: Washington, Bon Homme, South Dakota; Roll T623_1546; Page: 16A; Enumeration District: 20. [S244] U.S. Federal Census 1910 U.S. Federal Census, by Ancestry.com, Year: 1910; Census Place: Scotland, Bon Homme, South Dakota; Roll T624_1475; Page: 3A; Enumeration District: 23; Image: 765. Anna Klinkner was born in June 1884 at South Dakota. She was the daughter of Mathias H. Klinkner and Anna Tomas. Josephine Klinkner was born in June 1886 at South Dakota. Lillian Klinkner was born in July 1888 at South Dakota. Married Name 10 January 1916 As of 10 January 1916,her married name was Dawkins. She was the daughter of Mathias H. Klinkner and Elizabeth Mary Nierle. Nellie Klinkner married William T. Dawkins on 10 January 1916 at Pennington, South Dakota. 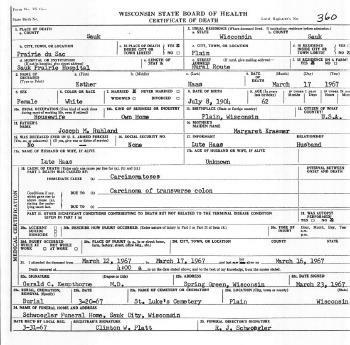 [S9] South Dakota, South Dakota Birth Records South Dakota, State File Number: 563050 File Date: 11/19/1941 (unknown file date). William T. Dawkins was born circa 1893. He married Nellie Klinkner, daughter of Mathias H. Klinkner and Elizabeth Mary Nierle, on 10 January 1916 at Pennington, South Dakota. Spencer J. Pfaff was born circa 1888. He married Barbara Katherina Klinkner, daughter of Mathias H. Klinkner and Elizabeth Mary Nierle, on 8 November 1918 at Pennington, South Dakota. Ray Rohrig was born circa 1896. He married Annie Henrietta Klinkner, daughter of Mathias H. Klinkner and Elizabeth Mary Nierle, on 1 August 1917 at Pennington, South Dakota. Homer Keel was born circa 1903. He married Margaret Cecelia Klinkner, daughter of Mathias H. Klinkner and Elizabeth Mary Nierle, on 9 January 1929 at Fall River, South Dakota. [S9] South Dakota, South Dakota Birth Records South Dakota, State File Number: 563032 File Date: 11/15/1941 (unknown file date). Name Variation Theresia (?) was also known as Thressa (?). Married Name circa 1905 As of circa 1905,her married name was Klinkner. Theresia (?) was born circa 1885 at South Dakota. She married Fredrick W. Klinkner, son of Mathias H. Klinkner and Anna Tomas, circa 1905. Theresia (?) had 3 with 2 living in 1910 children. Married Name 8 January 1931 As of 8 January 1931,her married name was Sternhagen. Mabel Klinkner was born on 1 October 1906 at South Dakota. She was the daughter of Fredrick W. Klinkner and Theresia (?). Mabel Klinkner married Erhart Sternhagen on 8 January 1931. Mabel Klinkner died on 3 December 1995 at age 89. Name Variation Thomas Klinkner was also known as Thom. Thomas Klinkner was born circa 1908 at South Dakota. He was the son of Fredrick W. Klinkner and Theresia (?). Gladys Klinkner was born circa 1912 at South Dakota.